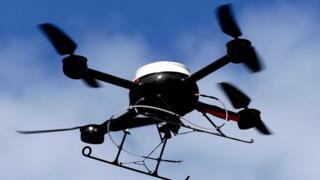 There were 18 near misses between aircraft and drones across Britain between July and October 2018, according to an air safety body. Out of the reported incidents, 12 took place in Greater London. The UK Airprox Board( UKAB) said the “highest risk of collision” occurred when a large “commercial drone” was considered to pass within 20 metres of an Airbus A3 80 as it approached Heathrow. Drone sightings disrupted about 1,000 flights at Gatwick Airport in December. Departures at Heathrow Airport were also halted temporarily after droning activity was reported earlier this month. How can a drone cause so much chaos ?